I began in the recycling and salvage business in the early 1980s. Like today, but not as bad, there was a housing boom and bust that made making a living and maintaining a home difficult for many. 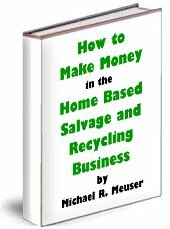 I was inspired to get into the recycling and salvage business after reading a little booklet titled, "Surplus and Salvage." I was amazed that everything I needed to improve my conditions and make a decent income were right in front of me - most everywhere I looked. Without the insights in that little booklet I would have never dug myself out of the hole I was in. 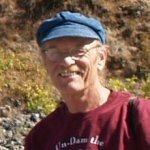 My hope is that this little article will help you see what is out there and how you might change your life for the better once you do. Recycling and salvage is much more than collecting cans, cardboard, paper, etc. and taking them to a recycling center. This works, but to a very limited degree. For me, recycling and salvage takes some creativity. In my mind, one of the reasons that our economy is failing is that "find a need and fill it" has become "create a need and fill it." Our economy is driven by greed and over-consumption instead of need. With enough money for advertising ANY need (e.g. desire) can be created. Recycling and salvage brings us back to a solid economic foundation based on need not greed. In this work we are really operating at the ground level of needs and fulfillment. When I started out I first went from business to business and asked them, "what is it that you need?" Just a few days of doing this produced a long list of things that I should be on the lookout for. It included: old brass valves for rebuilding, auto parts for rebuilding, electric motors and generators for rebuilding, wooden shelving, steel shelving, desks, chairs, file cabinets, hand tools, power tools, plumbing supplies, glass ... The list went on and on. So, now I had a list of things to keep my eye out for and had a range of how much I could sell them for. This eliminated a lot of guesswork and wheel-spinning. In the beginning, I brought my buyers small sample lots to make sure I knew exactly what they wanted and they knew exactly what they were getting. I did this too because I had very little capital and it was a way to build it up by turning it over quickly (check out High Profits from Turning Over Your Recycled and Salvage Material as Quickly and as Often as Possible for more on this). From then on I spent profitable time filling their needs. It is not always necessary to find specific buyers first. When dealing with building materials I knew from my own experience building things that used material was just as good, and in many cases better than new. Older lumber tends to be straighter and tighter grained; fixtures are of higher quality; steel roofing is thicker ... I knew that I didn't have to discover a need - it was already very apparent. To get building materials I placed small ads in local freebie newspapers saying that I would tear down any building or structure. I didn't say I'd do it for free because many would be more than happy to pay to have it done as long as it was less than the going rate for demolition. Once I negotiated an agreement, I'd inventory the building and make a list of the salvageable materials. I then placed more small free ads and posters on bulletin boards telling folks what I had, where and when to see it. Folks would show up on-site and in almost every case, the material was sold before I ever took the building down. I'd collect 50% down and 50% when they picked up the material. The buyers were always happy because they got material as good or better than they would new and paid a bit less for it. This way the cost of tearing down the building was totally paid for up front - that's bootstrapping at its best. For more on bootstrapping, check out Learn how to bootstrap your home-based recycling business. I've used deconstructed lumber in many progects myself. Awhile back a friend and I were asked to build a replica of a traditional Yurok Plank House for a local museum. The old plank houses were made of old-growth redwood. To make our model scale right and look authentic we had to find very tight grained old-growth redwood. After some head-scratching and looking we found a pile of old split stake fencing at a salvage yard. This turned out to be just right. The grain was very tight - 20 to 30 per inch. You can check out what we did with this salvaged lumber at YurokPlankHouse.com. In another instance, we used reclaimed lumber to build fences, arbors and gates. Old redwood piers were being torn down. A large contractor had bought most of it, but what was left in the to-go-to-the-landfill-pile was amazing. We found plenty of material there. Once we resawed and planed it, it was better than new. You can see what we did with it at RecycledWoodworks.com. I've also worked in the electronic and computer salvage, recycling and gold recovery field. Disposing of this material brought in the whole range of creative techniques Bcap and reuse. I've written some about this and will be writing more - check out My tips at Recycling Secrets. In a nutshell, I had to find buyers right away for enough material so that I could have the operating costs and equipment that I needed covered. The best items were very large batteries that were useable in home alternative energy systems. I then found buyers for recycled material and other buyers for reusable goods. Finally, when it was all over, I learned how to recover gold from the many plated surfaces.